Five Michigan youth will travel to Wisconsin this fall for the National 4-H Dairy Conference, thanks to a sponsorship from the Michigan Milk Producers Association. The top five selected are: Miriam Cook from Clinton County, Grace Sayles from Shiawassee County, Drew Neyer from Isabella County, Dylan Keller from Hillsdale County and Elyse Zimmerlee from Eaton County. The students were selected as Michigan delegates after attending the MMPA 4-H Milk Marketing Tour held annual in Novi, Michigan, at the MMPA headquarters. The participants with the highest scores on a dairy industry and cooperative quiz administered at the end of the tour were invited to interview in East Lansing during the Michigan Dairy Expo. The top five interviewees were announced during the State 4-H Dairy Banquet on July 20 and awarded a sponsored trip to the National 4-H Dairy Conference in Madison, Wisconsin on October 1-4. The National 4-H Dairy Conference, held in conjunction with World Dairy Expo, brings future dairy leaders together build upon their knowledge of the dairy industry. The five students sponsored by MMPA will join approximately 200 delegates from the U.S. and Canada. During the MMPA 4-H Milk Marketing Tour on June 27-28, 16 youth from 11 counties came together to learn about milk marketing and cooperatives. MMPA has welcomed 4-H and FFA members to the cooperative’s headquarters for the past 80 years to be immersed in the operations of the dairy cooperative and educated about milk marketing principles. Co-sponsored by MMPA and Michigan State University Extension, the Milk Marketing Tour is the longest running 4-H tour in existence with over 4,000 participant alumni. Throughout the tour, participants learned about the role of milk marketing cooperatives through interactive activities involving the MMPA staff members. Additionally, students visited Kroger’s Michigan Dairy plant in Livonia to see how milk is processed and packaged once it leaves the farm. 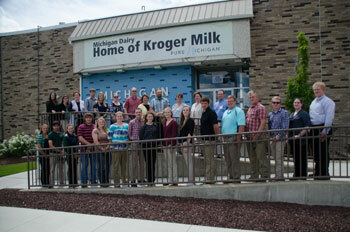 “I learned a lot about the sale of milk from the 4-H Dairy Tour. Getting to see the Kroger plant was a neat experience and I realized how much work goes into that final gallon you can pick up at the grocery store,” said Kyle Godley, a tour participant from Shiawassee County. This year’s attendees at the MMPA 4-H tour included: Drew Neyer, Catie Theisen, Grace Sayles, Jonathan Sayles, Eric Beebe, Adam Wiles, Jessica Parrish, Jordan Parrish, Miriam Cook, Abigail VanDyk, Kyle Godley, Chrissy Polzin, Dylan Keller, Will Sharrard, Carolyn Delong and Elyse Zimmerlee.